The eight participants were the highest rated contenders during our cocktail showdown. During the showdown four judges hit the town and were presented a drink and a shot at once a week for nine weeks at three participating locations. They were rated on a scale of 1-10 in three categories: presentation, taste, and creativity. It was essentially a nine week quest to find the best in the bar business and resulted in a friendly competition, in which nearly 30 bars in the area participated. In previous years The Hub was home to the Bartender’s Battle, this year the battle has been relocated to The Crystal Ballroom at The Ramada. There will be a Vegas theme in 2016 and no detail has gone unnoticed. Patrons can look forward to roulette wheels, craps tables and showgirls ala Blue Belle Burlesque. There will also be an Elvis Presley costume contest. If you are stuck on what to wear, think Vegas class, sass, and everything in between. Whether you choose to practice your showgirl strut, suit up like Sinatra and the Rat Pack, or dress to impress to hit the strip. 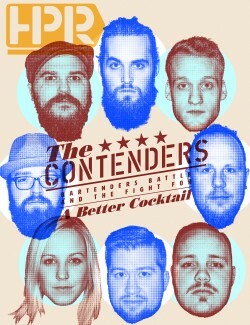 This year’s contenders are Andrew Hardy of Usher’s House, Steve Dahl of the Cork and Cleaver, Kyle Berglund of Rustica Restaurant, Jared Winmill of Rustica Tavern, Alison Buecksler of Dempsey’s, Matthew Lewellen of HoDo Lounge, Elijah Larson of Proof Artisan Distillers, and Anthony Dub from The Green Mill. HPR: Can you tell us about your bartending experience? AH: My Bartending experience, well, I started bartending at O'Leary's in Moorhead. I was actually the kitchen manager there for about 3 years before I started working the door and bar backing. I picked up some random bartending shifts and it took off from there. I worked at the Sidestreet for about 4.5 years and then I took over running Usher's House bar and Front of House. HPR: Can you tell us your favorite part about the bar industry and what keeps you in the industry? AH: My favorite part about the industry is just that itself. The industry. The people I meet, the friends I've made and the name I am trying to forge for myself. I stay in this industry because I love it. I have a passion for the knowledge and the care of the drinks. It allows me to be creative and has become my love and art. HPR: What is your favorite mixology trend? HPR: What is your drink of choice? AH: My drink of choice is an Old Fashioned...but to be fair anything with Rye is going down my gullet without discrimination. HPR: What is your favorite mixer? AH: My favorite mixer is probably Ginger Beer. I will say though, I have found more joy lately in just using liquors, minus an actual mixer. AH I've been working behind the Bar for 15yrs. I've worked in high volume bars, to fine dining boutique restaurants. AH: I love the people, patrons, regulars, and coworkers. The people who sit at my bar, and my coworkers, have become my friends. We are like one very big, very odd, happy family. What is your favorite mixology trend? I think infused Gin is my favorite, they can add unique twists to old classics. I also like to see a new generation, enjoying more refined whiskey, single malts and single barrel. Can you tell us about your bartending experience? Can you tell us your favorite part about the bar industry and what keeps you in the industry? The people involved and the relationships you make. What is your favorite mixer? I have had a little experience bartending before my time with Rustica, and wanted to bartend since a young age. My father is a beer sales rep and I grew up around the industry. I used to hang around kirby's on Saturday mornings with my brother, so it's kind of funny how I now work in the same building. I’ve only been bartending full time since last april when the tavern opened up. I started at Rustica a couple months after they opened doing a little bit of everything until the tavern opened up. My boss/general manager Mason has helped me hone my bartending craft in a short amount of time. Can you tell us your favorite part about the industry is and what keeps you in the industry? It’s all about the people. My customers and especially regulars keep keep me going. Meeting and getting to hang out/craft drinks for some of Fargo-Moorhead’s greatest people keeps me going, and their support helps carry me on. I like the general trend of going back to the classics, and putting a thoughtful modern/personal twist on it to make it your own. An old fashioned -- Nice whiskey , orange, bitters and good cherries is just a perfect mix for me. I started bartending 7 years ago, I worked at a sports bar restaurant and the day I turned 21 they threw me behind the bar. I stuck around for about a year, then moved over to Dempseys. This is where I learned everything I needed to know about bartending. Learning how to manage and pour in a high volume bar was tricky but now I couldn't imagine working anywhere else. Ive also had some experience working in Sturgis as well, but that's on a whole new level! My favorite part of working in this industry is working with a genuine staff, serving great customers, and the connections you gain. Going to work is different when working in a bar, the staff becomes your family and it’s a place to have fun and be creative. I would never want to leave a job like this because you meet so many people inside and outside of Fargo, get to build friendships with regulars, and you learn something new everyday. Everybody knows that Fargo is a thirsty town so you know the money will always be there. Trends change all too often, I like to stick to seasonal trends. Creative hot drinks in the winter,and sweet refreshing drinks in the summer. My go to drink is a Snakebite beer, Cider beer with a Guinness float complimented with a shot of Jameson and pickle back. I grew up in restaurants in bars, I’ve spent half of my life working in restaurants. I started barbacking in Southern California at an Asian Fusion/Rum Bar. But I gained the bulk of my experience at The Hodo. I like to make people happy. I like to see a smile on a guest’s face when they are enjoying themselves. The most precious thing a person has is time and if they choose to spend their time with me… I know I am doing my job right. I've been bartending at the Green Mill for over 8 years and was the bar manager at the Green Mill for 5 years. I was trained under the former bar manager Matt Schumacher who showed me the ins and outs of the trade. I enjoy providing a great atmosphere with excellent service and drinks. A lot of people work hard and it's nice to let them come to your establishment and just relax and take a load off. I also enjoy creating new cocktails or putting twists on classic recipes that people won't forget. My favorite trend would be using local ingredients to create amazing libations; "farm to table" aspect for bartenders. It's great to see local establishments starting to distill their own liquors as well. I'm a whiskey guy, so I like a good Manhattan or old fashion. I started in this racket on Dec 31st 2003 in a little bar in West Fargo. It was a pretty part time gig. My best friend worked there and his aunt owned the place. It was mostly holidays and special events like Regulars(customers) birthday parties and chili cook-offs. A truly mid-western introduction to the industry. From there I went to work for Dempseys in 2006, O'Learys in 2011, the last few years I've helped open a few new downtown restaurants and I currently oversee the beverage program and service operations for Proof Artisan Distillers. People don't go to bars to drink. People go to bars to interact. It's that interaction that has kept me in the industry. It has always been and will always be about the people. When it comes to mixing something up I'm a two dashes and a splash kind of guy.